Doris E. Christiansen, age 90, of Buffalo Lake, passed away Sunday, November 4, 2018, at the Buffalo Lake Healthcare Center. Funeral Service will be held Wednesday, November 7, 2018 at 2:00 P.M. at St. John’s Lutheran Church in Cedar Mills Township, with interment in the church cemetery. Visitation will be held Wednesday, November 7, 2018, at St. John’s Lutheran Church beginning at 1:00 P.M., for one hour prior to the service. Doris Emma (Schlueter) Christiansen was born on December 16, 1927 at home in Cedar Mills, Meeker County, Minnesota. She was the daughter of Rudolph and Emma (Kaliebe) Schlueter. 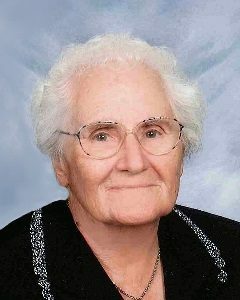 Doris was baptized as an infant and later confirmed at her lifelong church of St. John’s Lutheran Church in Cedar Mills. On July 17, 1960, Doris was united in marriage to Lowell Christiansen at St. John’s Lutheran Church. Their union was blessed with two children, Karen and Brian. They lived their entire married life on Lowell’s family’s home place. Doris was her husband’s partner in farming. She was either in the tractor or feeding the animals on the farm. She enjoyed farm life to its fullest being involved with the farming operation. Doris and Lowell shared 58 years of marriage. Doris was a member of St. John’s Lutheran Church where she taught Sunday School and was a faithful member all of her life. Doris enjoyed gardening and canning what she grew. She loved to bake and make meals for her family. The cookie jar was always full and you never left the table hungry. She enjoyed entertaining on holidays, and at deer hunting season she made sure all the family hunters had a dinner ready. In her spare time she liked to quilt, embroider, and do jigsaw puzzles. Doris loved to spend time with her family. She loved to have a good laugh and hear a good joke. Her children and grandchildren can tell of many stories and pranks they played with her. A hard journey began for Doris in March of 2010 when she was told she would need kidney dialysis. She faced it with her strong faith. In October, 2018, she said “No more.” She was ready for the Lord. She knew that she was failing in health. Doris resided at the Buffalo Lake Healthcare Center the past four years with her husband, Lowell. She enjoyed living there and met many new friends, which included the caring staff. In the early morning hours of November 4, 2018, Doris passed away there having reached the age of 90 years. Doris’ journey on earth has ended, but life in eternity has just begun. Blessed be her memory. Doris is preceded in death by her: Parents, Rudolph and Emma Schlueter; Parents-in-law, Christ and Anna Christiansen; Sister, Dina Rewerts; Brothers: Harry Schlueter, George Schlueter, Ernie Schlueter, Edward Schlueter in infancy; Sister-in-laws: Wanda Schlueter, Estella Schlueter; Brother-in-law, Fred Rewerts; Niece, Jean Walter. Doris was my aunt memories will always be with me. She was such a loving person. Made the best of the worst. You are at peace an angel for sure. Thoughts with all her family and friends. She will be missed.